Get access to over 1500 questions for the GMAT exam in one package. The GMAT Official Guide 2018 Bundle features actual questions from past GMAT exams—including 220 never-before-seen questions- and consists of The GMAT Official Guide 2018, The GMAT Official Guide 2018 Verbal Review, and The GMAT Official Guide 2018 Quantitative Review. 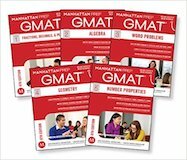 All three guides also come with exclusive access to gmat.wiley.com, where you can build your own practice sets using the questions in the guides and access an additional 58 integrated reasoning questions. The GMAT Official Guide Quantitative Review provides targeted preparation for the mathematical portion of the GMAT exam. Designed by the Graduate Management Admission Council, this guide contains 300 real GMAT questions from past exams including 45 never-before-seen questions. 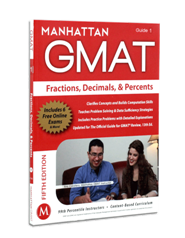 The 10 Manhattan Prep GMAT Strategy Guides included in this set are designed to be clear and comprehensive. Consistently reviewed by students as offering the opportunity for dramatic score improvement, each book delves deeply into a single area of the exam, providing detailed and specialized instruction. When used together, these guides produce a substantial learning impact, helping students develop all the knowledge, skills, and strategic thinking necessary for success on the GMAT. 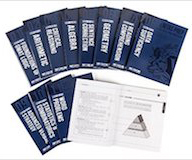 Students will benefit considerably from high-level resources such as:-Six full-length, computer-adaptive practice exams-Over 200 additional free practice questions-New content providing strategies for solving problems more effectively-Topical sets of Official Guide practice questions and detailed answer explanations. 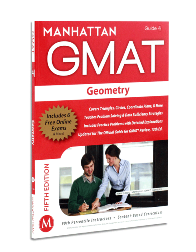 The Complete GMAT Strategy Guide Set is aligned to the GMAC Official Guide, 2015 and 13th Editions. Kaplan's GMAT Complete 2018 is your comprehensive guide acing the GMAT—master our proven strategies with four best-selling prep books, review key content, practice your pacing, and become an expert in the exam's computerized format with online practice. Kaplan is so certain that GMAT Complete 2018 offers all the knowledge you need to excel at the GMAT that we guarantee it: After studying with the online resources and books, you'll score higher on the GMAT—or you'll get your money back. With GMAT Complete 2018 you can prep on-the-go. Log in from anywhere to do practice sets and even practice tests that are optimized for your mobile device. Kaplan's GMAT Prep Plus 2018 guides you through your GMAT prep step by step, with online practice and videos to ensure you're ready for Test Day. Study Kaplan's proven strategies, practice your pacing, and become an expert in the exam's computerized format with five online practice tests. Kaplan is so certain that GMAT Prep Plus 2018 offers all the guidance you need to excel on the GMAT that we guarantee it: After studying with the online resources and book, you’ll score higher on the GMAT—or you'll get your money back. Get everything in our GMAT Prep 2018 package, plus 4 more online practice tests, 700+ additional practice questions, timed practice sets, a customizable online Quiz Bank, and video workshops that can help you ace the GMAT. Rusty on math? This workbook is designed to build a strong foundation in the math skills essential for success on the GMAT: Arithmetic, Algebra, and Geometry. Dana’s perspective: A great book--but it's not for everyone! 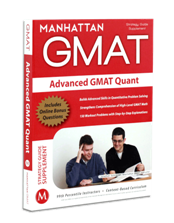 Build your higher-level quantitative skills with the brand new edition of Manhattan Prep's GMAT Advanced Quant book, specially designed for students seeking 700+ scores. This strategy supplement combines intense practice with advanced techniques for problem solving and data sufficiency questions, ranging from broad principles to tactics for narrowing down possible answers. Includes over 150 "Workout Problems" to test you on the toughest quant concepts. Acing the GMAT requires more than tricks and tips—you've got to master the material. Students looking to boost their GMAT quant score can now turn to a name known for high quality instruction. 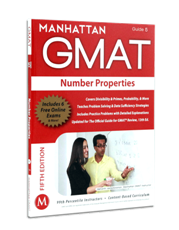 Manhattan Prep's GMAT Quantitative Strategy Guide Set includes our 5 books devoted to this section's major content areas, providing detailed and specialized instruction on Number Properties, Fractions, Decimals, and Percents, Word Problems, Algebra, and Geometry. Developed by the best teachers in the business, these 5 guides are the backbone of Manhattan GMAT's quantitative curriculum and the most in-depth, comprehensive materials available. Purchase of this set includes one year of access to 5 Quantitative Questions Banks. The most comprehensive GMAT study kit available. With the purchase of this study kit, you will get access to more than 1,000 practice questions and an online portal of resources to help you with your preparation. 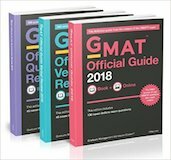 Resources include: comprehensive solutions to the practice questions, free access to the Veritas Prep Question Bank that contains hundreds of realistic GMAT questions and item difficulty feedback, a free adaptive GMAT practice test and 14 in-depth guides to the world's top business schools. 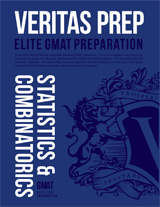 The following books are included in the study kit: Foundations of GMAT Logic, Arithmetic, Critical Reasoning, Algebra, Sentence Correction, Geometry, Reading Comprehension, Data Sufficiency, Advanced Verbal Strategy, Statistics and Combinatorics, Advanced Word Problems, and AWA & Integrated Reasoning. For many GMAT test-takers, the topics of Statistics, Combinatorics, and Probability loom as the most challenging content areas tested on the exam, particularly because it s not uncommon for students to have not encountered these subjects in a high school or college curriculum. This lesson, accordingly, builds from the basic elements of each content area with a thorough Skillbuilder section full of definitions, drill problems, and explanations. From there, students complete a GMAT-specific lesson that progresses to the most advanced applications used by the exam to challenge 700+ scorers. And to practice these skills and strategies, the lesson offers over 100 GMAT-style practice problems, each with a detailed explanation of how to employ the lessons from the book to successfully navigate these questions on test day. The GMAT Official Guide 2018 is the definitive guide from the Graduate Management Admission Council, the makers of the GMAT exam. 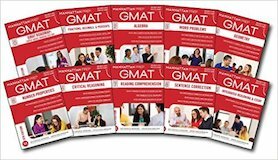 It contains over 900 real GMAT questions from past exams, including 130 never-before-seen questions. Don’t waste time practicing on fake GMAT questions. Optimize your study time with the GMAT Official Guide 2018 using real questions from actual past exams. The GMAT Official Guide 2018 Verbal Review provides additional practical preparation focused on the verbal portion of the exam. Written by the Graduate Management Admission Council, this guide contains 300 real GMAT questions from past exams, including 45 never-before-seen questions. Master Content. Upgrade your Mind. Elevate your Score! - Includes Bonus TPNY Full Potential Handbook for test-day success. - 200+ detailed examples and valuable tips based on real GMAT questions. - Effective approaches for non-native speakers and different learning styles. - Fool-proof techniques for mastering each type of Sentence Correction question. From grammar rules to paragraph structure, specific verbal skills are required on the GMAT. Kaplan's GMAT Verbal Workbook covers methods for all Verbal question types on the GMAT and for the Analytical Writing Assessment. 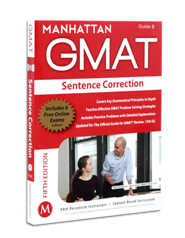 Dana’s perspective: This is the best GMAT Sentence Correction guide available! Adapting to the ever-changing GMAT exam, Manhattan Prep’s GMAT Foundations of Verbal offers the latest approaches for students looking to improve their verbal scores. 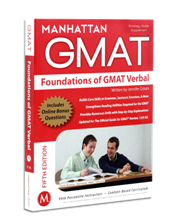 Manhattan Prep’s GMAT Foundations of Verbal covers all of the fundamental verbal concepts tested on the GMAT. 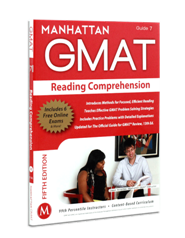 Updated to reflect Manhattan Prep's enhanced GMAT verbal curriculum, this book covers everything from foundational grammar, such as parts of speech and sentence structure, to logical reasoning and reading comprehension. This new edition provides up-to-date strategies for tackling the three verbal question types—Sentence Correction, Critical Reasoning, and Reading Comprehension—along with easy-to-follow examples and comprehensive explanations. This book is an invaluable resource for students looking to establish a strong foundation upon which to build their later GMAT study. Purchase of this book includes access to the Foundations of Verbal Homework Bank of extra practice questions and detailed explanations not included in the book, as well as to the Foundations of Verbal Bonus Drill Set. Acing the GMAT requires more than tricks and tips—you've got to master the material. Students looking to boost their GMAT verbal score can now turn to a name known for high quality instruction. 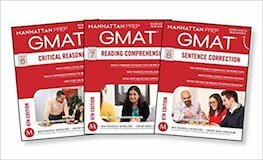 Manhattan Prep's GMAT Verbal Strategy Guide Set includes our 3 books devoted to this section's major content areas, providing detailed and specialized instruction on Sentence Correction, Critical Reasoning, and Reading Comprehension. Developed by the best teachers in the business, these guides are the backbone of Manhattan Prep's GMAT verbal curriculum and the most in-depth, comprehensive materials available. Purchase of this set includes one year of access to 3 Verbal Question Banks. 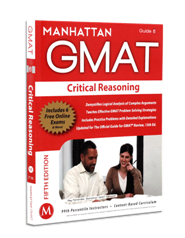 The PowerScore GMAT Critical Reasoning Bible will teach you how to break down GMAT argumentation, how to recognize GMAT question types, and how to separate correct answers from incorrect answers. You will improve your accuracy in answering questions and your speed as well. If you are shooting for the highest score possible, the Critical Reasoning Bible will help you maximize your performance. The approaches discussed in the Critical Reasoning Bible are also useful when attacking Reading Comprehension questions. The Critical Reasoning Bible is supplemented by an exclusive website that provides additional material for the book, including suggested study plans and answers to frequently asked student questions. Dana’s perspective: Awesome source of GMAT Reading Comprehension practice problems!